The controversies that revolved around Andrew Jackson stimulated the formation of the Second American Two Party System The term "'Whig" was first used in 1832 by the anti-tariff leaders of South Carolina, but it soon came to be applied to all elements that found themselves opposed to the Jacksonian Democratic party. The Whigs first emerged as an identifiable group in the Senate, where Clay and Calhoun joined forces in 1834 to pass a motion censuring Jackson for his removal of federal deposits from the Second Bank of the United States. (5) the remnants of the Anti-Masonic party. Thus, Jackson's economic and political practices inspired opposition from all three sections of the country, giving the Whig party a truly national character. 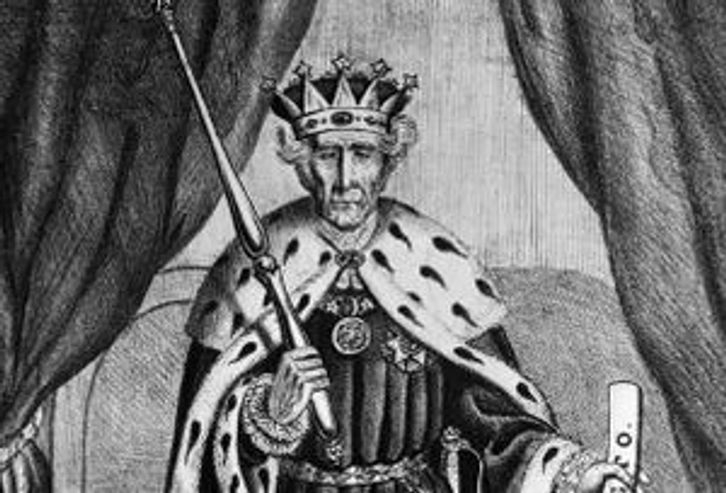 The name Whig was chosen because it suggested that, as the Whigs of the 1770's had stood up against King George III, so the Whigs of the Andrew I". The Whigs believed it was natural for a relatively few individuals to acquire a large share of the wealth. They believed the increasing concentrations of power and wealth that accompanied the advance of modem banking, manufacturing, and transportation furthered the welfare of the entire community. The northern Whigs attempted to reconcile their elitism with republican ideals in several ways. First, they asserted that American society was really classless because it did not ascribe permanent status to groups an individuals and because its institutions fostered upward mobility. Second, they argued that it was natural in a republic for wealthy individuals to represent other citizens. Constrained by a republican Constitution and by the moral influence of religion, elites would govem in the best interests of all. Third, the Whigs argued that the ruling class promoted industrialization and economic growth, which in turn strengthened the republic by creating a more prosperous citizenry and by merging the interests of labor and capital. 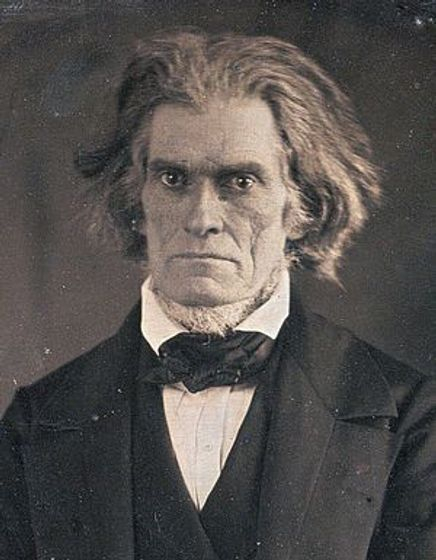 The Southern Whigs represented by Calhoun argued that the northern Whig ideal of equal opportunity contradicted the realities of slavery and of industrial society. Calhoun felt that southern slave owners and northern factory owners belonged to the same privileged class and faced the same threat from below. He therefore urged northern factory capitalists to join a defensive alliance with the Planters. Calhoun's view was that social harmony was possible only with recognition, acceptance, and reinforcement of existing, sharp distinctions of class. Whigs, he argued, ought to unite around a common defense of privilege and social order. The significance of the Whig Party was that it was a national party that represented the interest of BOTH the large industrial and planter aristocracy at once and provided a means by which the two economic groups could possibly work out their differences. The Whigs criticized Jackson and the Democrats for underestimating possibilities for upward mobility, for pitting the poor against the rich, and for disrupting social harmony. They attacked Jackson's strong presidency by warning against strong, highly individualistic executives. As an alternative, the Whigs offered legislative rule and a program of governmental intervention in the economy. They wanted to see a more vigorous national government, with Congress, rather than the president, exercising leadership. industrialization that was taking place in the United States had a marked impact on politics. The industrialization strengthened the commitment of the urban middle class and prosperous farmers of the North to the values of the business elite, to the Whig party and to their economic programs of the American System. With William Henry Harrison's presidential victory over Martin Van Buren in the election of 1840, the Whigs'political future looked bright. The Whigs found to their delight that the Panic of 1837 and the rapid industrialization that was taking place in the United States had a marked impact on politics. The industrialization strengthened the commitment of the urban middle class and prosperous farmers of the North to the values of the business elite, to the Whig party and to their economic programs of the American System. At first, Tyler signed several pieces of Whig legislation, including the Log Cabin Bill that gave squatters first rights to buy federal land at low prices. But then Henry Clay, the leader of his own party, presented Tyler with a number of banking bills, knowing he would veto them. It was an attempt to discredit Tyler in the next election, which Clay hoped to win. Next, Clay convinced all of the cabinet but one, Daniel Webster, to resign on September 11, 1841, hoping that Tyler himself would then resign. He did not, and President Tyler was officially kicked out of the Whig Party. Congress repeatedly rejected the people he nominated to fill the vacant cabinet positions. Ultimately, all but one of his cabinet members were Southerners. When these men left the Whig Party, it forged a regional split in which the Whigs became the 'Northern party' and the Democrats became the 'Southern party'. From this point on, Congress voted in opposition to pretty much every domestic policy he supported. Two Supreme Court seats opened up, and Congress rejected four of Tyler's nominees before one of them was finally confirmed. The other seat was never filled, as the Senate hoped Henry Clay might fill it. The final breaking point came with a conflict that sounds like it could be lifted from the pages of any newspaper today. His entire political career, Tyler had opposed higher tariffs and federal growth. But now the government was facing a severe budget deficit. He called a special session of Congress and proposed a compromise: raise some of the taxes, but cut spending on internal improvements. The Whigs countered with a bill that raised taxes as well as spending. Tyler vetoed it, and the budget battle raged for over a year. Citing Tyler's misuse of the veto for policy reasons, Congress initiated impeachment proceedings against a president for the first time ever in 1842. Clay's opponent was an unlikely candidate. James K. Polk was a Democrat from Tennessee, much like Andrew Jackson had been. Polk had been Speaker of the House during the Jackson presidency and favored many of the same policies. In 1839, he was elected Governor of Tennessee, strengthening his political resume. He lost reelection in 1841, but continued his political career. He received the Democratic nomination for president in 1844 after first seeking the nomination for vice president. Front runner and former president Martin Van Buren opposed the annexation of Texas, a major issue at this time. Polk favored the annexation, and won the nomination because of it. In 1844, James K. Polk, a Jacksonian Democrat from Tennessee, defeated the Whig candidate, Henry Clay, in the presidential election. Clay's defeat was the final blow to the American System and the Whig's economic program. party. 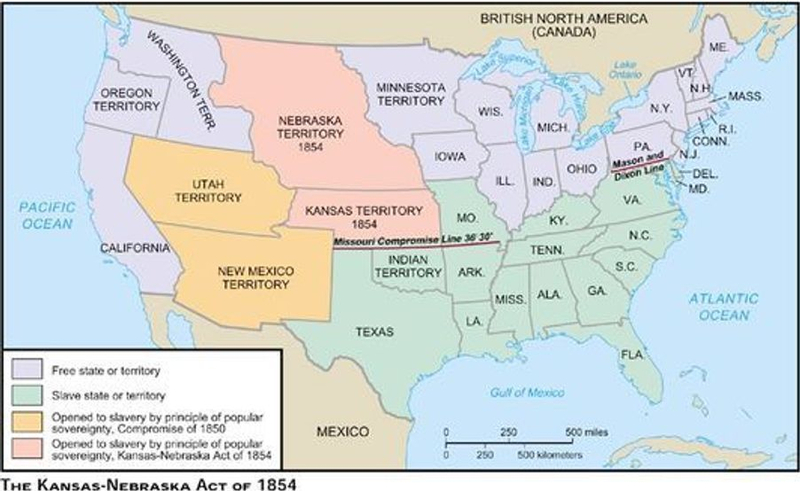 The stage was now set for the replacement of Clay's American System by the issue of FREE SOIL (keeping slavery out of the new territories) as the central economic issue. 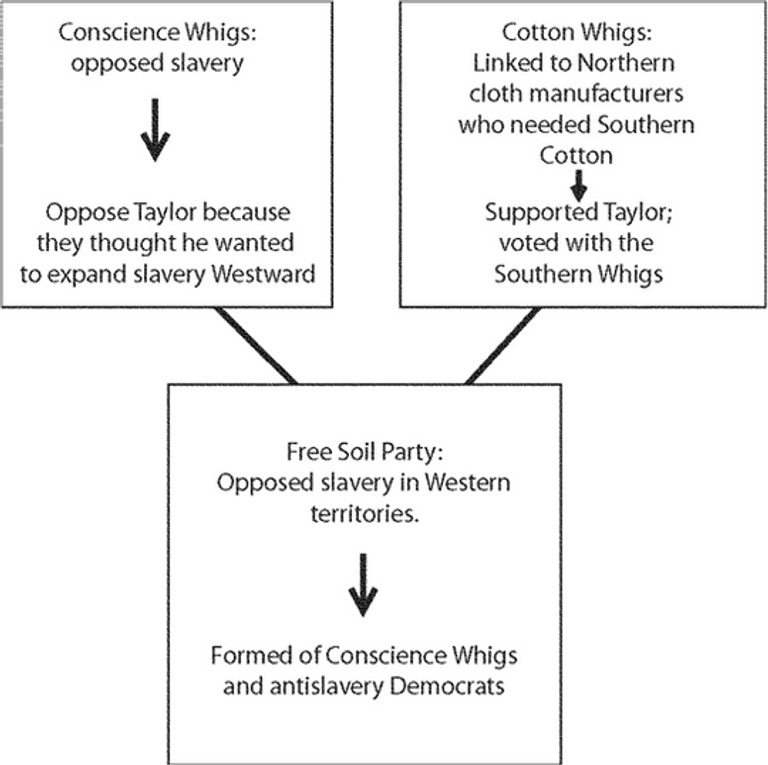 This NEW issue led to sectional disputes between the southern Whigs (cotton whigs) who were proslavery, as opposed to the northern Whigs (conscience whigs) who were opposed to the EXPANSION of slavery. The dream of creating a democratic utopia in the West ultimately rested on those who picked up their possessions and their families and moved west. Western settlers usually migrated as families and settled along navigable and potable rivers. Settlements often coalesced around local traditions, especially religion, carried from eastern settlements. These shared understandings encouraged a strong sense of cooperation among western settlers that forged communities on the frontier. Before the Mexican War, the West for most Americans still referred to the fertile area between the Appalachian Mountains and the Mississippi River with a slight amount of overspill beyond its banks. With soil exhaustion and land competition increasing in the East, most early western migrants sought a greater measure of stability and self-sufficiency by engaging in small scale farming. Boosters of these new agricultural areas along with the U.S. government encouraged perceptions of the West as a land of hard-built opportunity that promised personal and national bounty. Women migrants bore the unique double burden of travel while also being expected to conform to restrictive gender norms. Societal standards such as “the cult of true womanhood,” which emphasized piety, purity, domesticity, and submissiveness as the key virtues of women, along with the concept of “separate spheres,” which focused on the proper roles of women in the home, often accompanied men and women as they traveled west to begin their new lives. While many of these societal standards endured, there often existed an openness of frontier society that resulted in modestly more opportunities for women. Husbands needed partners in setting up a homestead and working in the field to provide food for the family. Suitable wives were often in short supply, enabling some to informally negotiate more power in their households. Americans debated the role of government in westward expansion. This debate centered on the proper role of the U.S. government in paying for the internal improvements that soon became necessary to encourage and support economic development. Some saw frontier development as a self-driven undertaking that necessitated private risk and investment devoid of government interference. Others saw the federal government’s role as providing the infrastructural development needed to give migrants the push toward engagement with the larger national economy. In the end, federal aid proved essential for the conquest and settlement of the region. Economic busts constantly threatened western farmers and communities. As the economy worsened after the panic of 1819, farmers were unable to pay their loans due to falling prices and over-farming. The dream of subsistence and stability abruptly ended as many migrants lost their land and felt the hand of the distant market economy forcing them even farther west to escape debt. As a result, the federal government consistently sought to increase access to land in the West, including efforts to lower the amount of land required for purchase. Smaller lots made it easier for more farmers to clear land and begin farming faster. More than anything else, new roads and canals provided conduits for migration and settlement. Improvements in travel and exchange fueled economic growth in the 1820s and 1830s. Canal improvements expanded in the East, while road building prevailed in the West. Congress continued to allocate funds for internal improvements. Federal money pushed the National Road, begun in 1811, farther west every year. Laborers needed to construct these improvements increased employment opportunities and encouraged non-farmers to move to the West. Wealth promised by engagement with the new economy was hard to reject. However, roads were expensive to build and maintain and some Americans strongly opposed spending money on these improvements. The use of steamboats grew quickly throughout the 1810s and into the 1820s. As water trade and travel grew in popularity, local and state governments along with the federal government all allocated funds for the improvement and connecting of rivers and streams. Hundreds of miles of new canals cut through the eastern landscape. The most notable of these early projects was the Erie Canal. That project, completed in 1825, linked the Great Lakes to New York City. The profitability of the canal helped New York outpace its east coast rivals to become the center for commercial import and export in the United States. Early railroads like the Baltimore and Ohio line hoped to link mid-Atlantic cities with lucrative western trade routes. Railroads encouraged the rapid growth of towns and cities all along their routes through the encouragement of boosterism in search of speculative profits. Not only did rail lines promise to move commerce faster, but the rails also encouraged the spreading of towns farther away from traditional locations along waterways. Technological limitations, constant repairs, conflicts with American Indians, and political disagreements, all hampered railroading and kept canals and steamboats as integral parts of the transportation system. Nonetheless, this early establishment of railroads enabled a rapid expansion after the Civil War. Economic chains of interdependence stretched over hundreds of miles of land and through thousands of contracts and remittances. America’s manifest destiny became wedded not only to territorial expansion, but also to economic development. The debate over slavery became one of the prime forces behind the Texas revolution and that republic’s annexation to the United States. After gaining its independence from Spain in 1821, Mexico hoped to attract new settlers to its northern areas in order to create a buffer between it and the expanding western populations of the United States. New immigrants, mostly from the southern United States, poured into Texas. Over the next twenty-five years, concerns over growing Anglo influence and possible American designs on Texas produced great friction between Mexican and American populations. In 1829, Mexico, hoping to quell both anger and immigration, outlawed slavery and required all new immigrants to convert to Catholicism. American immigrants, eager to expand their agricultural fortunes, largely ignored these requirements. In response, Mexican authorities closed their territory to any new immigration in 1830 – a prohibition ignored by Americans who often squatted on public lands. In 1834, an internal conflict between federalists and centralists in the Mexican government led to the political ascendency of General Antonio Lopez de Santa Anna. Santa Anna, governing as a dictator, repudiated the federalist Constitution of 1824, pursued a policy of authoritarian central control, and crushed several revolts throughout Mexico. Texian (as they called themselves) settlers opposed Santa Anna’s centralizing policies and met in November after issued a statement of purpose that emphasized their commitment to the Constitution of 1824 and declared Texas to be a separate state within Mexico. After the Mexican government angrily rejected the offer, Texian leaders soon abandoned their fight for the Constitution of 1824 and declared independence on March 2, 1836. The Texas Revolution of 1835-1836 was a successful secessionist movement in the northern district of the Mexican state of Coahuila y Tejas that resulted in an independent Republic of Texas. At the Alamo and Goliad, Santa Anna crushed smaller rebel forces and massacred hundreds of Texian prisoners. The Mexican army pursued the retreating Texian army deep into East Texas, spurring a mass panic and evacuation by American civilians known as the “Runaway Scrape.” The confident Santa Anna consistently failed to make adequate defensive preparations; an oversight that eventually led to a surprise attack from the outnumbered Texian army led by Sam Houston on April 21, 1836. The battle of San Jacinto lasted only eighteen minutes and resulted in a decisive victory for the Texians, who retaliated for previous Mexican atrocities by killing fleeing and surrendering Mexican soldiers for hours after the initial assault. Santa Anna was captured in the aftermath and compelled to sign the Treaty of Velasco on May 14, 1836, by which he agreed to withdraw his army from Texas and acknowledged Texas independence. Although a new Mexican government never recognized the Republic of Texas, the United States and several other nations gave the new country diplomatic recognition. Texas annexation had remained a political landmine since the Republic declared independence from Mexico in 1836. American politicians feared that adding Texas to the Union would provoke a war with Mexico and re-ignite sectional tensions by throwing off the balance between free and slave states. However, after his expulsion from the Whig party, President John Tyler saw Texas statehood as the key to saving his political career. In 1842, he began work on opening annexation to national debate. Harnessing public outcry over the issue, Democrat James K. Polk rose from virtual obscurity to win the presidential election of 1844. Polk and his party campaigned on promises of westward expansion, with eyes toward Texas, Oregon, and California. In the final days of his presidency, Tyler at last extended an official offer to Texas on March 3, 1845. The republic accepted on July 4, becoming the twenty-eighth state. Mexico denounced annexation as “an act of aggression, the most unjust which can be found recorded in the annals of modern history.”10 Beyond the anger produced by annexation, perhaps the most important tangible conflict between Mexico and the United States, at this point, was a narrow strip of land to which both countries now laid claim. Mexico drew the southwestern border of Texas at the Nueces River, but Texans claimed that the border lay roughly 150 miles further west at the Rio Grande. Neither claim was realistic since the sparsely populated area, known as the Nueces strip, was in fact controlled by independent American Indian tribes. In November of 1845, President Polk secretly dispatched John Slidell to Mexico City in order to attempt a purchase of the Nueces strip along with large sections of New Mexico and California. The mission was an empty gesture, designed largely to pacify those in Washington who insisted on diplomacy before war. Predictably, officials in Mexico City refused to receive Slidell. In preparation for the assumed failure of the negotiations, Polk preemptively sent a 4,000 man army under General Zachary Taylor to Corpus Christi, Texas, just northeast of the Nueces River. Upon word of Slidell’s rebuff in January 1846, Polk ordered Taylor to cross into the disputed territory. The President hoped that this show of force would push the lands of California onto the bargaining table as well. Unfortunately, he badly misread the situation. 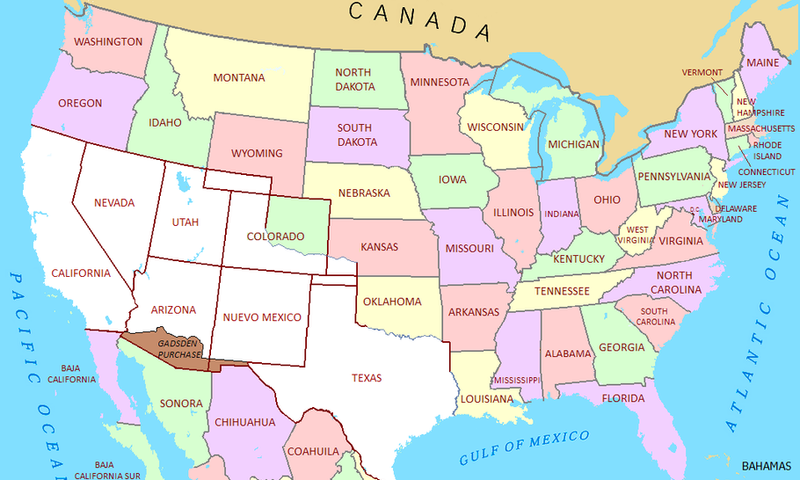 After losing Texas, the Mexican public strongly opposed surrendering any more ground to the United States. Popular opinion left the shaky government in Mexico City without room to negotiate. On April 24, Mexican cavalrymen attacked a detachment of Taylor’s troops in the disputed territory just north of the Rio Grande, killing eleven U.S. soldiers. It took two weeks for the news to reach Washington. Polk sent a message to Congress on May 11 that summed up the assumptions and intentions of the United States. The cagey Polk knew that since hostilities already existed, political dissent would be dangerous – a vote against war became a vote against supporting American soldiers under fire. Congress passed a declaration of war on May 13. Only a few members of both parties, notably John Quincy Adams and John C. Calhoun, voted against the measure. Upon declaring war in 1846, Congress issued a call for 50,000 volunteer soldiers. Spurred by promises of adventure and conquest abroad, thousands of eager men flocked to assembly points across the country. However, opposition to “Mr. Polk’s War” soon grew. In the early fall of 1846, the U.S. Army invaded Mexico on multiple fronts and within a year’s time General Winfield Scott’s men took control of Mexico City. However, the city’s fall did not bring an end to the war. 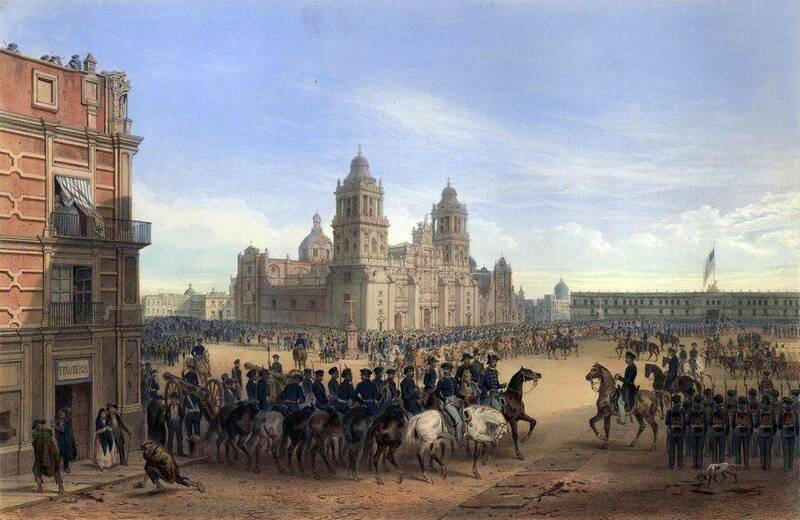 Scott’s men occupied Mexico’s capital for over four months while the two countries negotiated. In the United States, the war had been controversial from the beginning. Embedded journalists sent back detailed reports from the front lines, and a divided press viciously debated the news. Volunteers found that war was not as they expected. Disease killed seven times as many American soldiers as combat. Harsh discipline, conflict within the ranks, and violent clashes with civilians led soldiers to desert in huge numbers. Peace finally came on February 2, 1848 with the signing of the Treaty of Guadalupe Hidalgo. The new American Southwest attracted a diverse group of entrepreneurs and settlers to the commercial towns of New Mexico, the fertile lands of eastern Texas, and the famed gold deposits of California and the Rocky Mountain chains. This postwar migration built upon migration to the region dating back to the 1820s, when the lucrative Santa Fe trade enticed merchants to New Mexico and generous land grants brought numerous settlers to Texas. The Gadsden Purchase of 1854 further added to American gains north of Mexico. The U.S.-Mexican War had an enormous impact on both countries. The American victory helped set the United States on the path to becoming a world power, elevated Zachary Taylor to the presidency, and served as a training ground for many of the Civil War’s future commanders. Most significantly, however, Mexico lost roughly half of its territory. Yet, the United States’ victory was not without danger. Ralph Waldo Emerson, an outspoken critic, predicted ominously at the beginning of the conflict, “We will conquer Mexico, but it will be as the man who swallows the arsenic which will bring him down in turn. Mexico will poison us.”12 Indeed, the conflict over whether or not to extend slavery into the newly won territory pushed the nation ever closer to disunion and civil war. Territory ceded by Mexico is in white, Mexico lost two thirds of its territory. (click for enlarged version). Underlying the rapid growth of the Republican Party was the strong and growing appeal of its position on slavery. Republicans viewed the West as a land of opportunity, a place to which the ambitious and hardworking could migrate in the hopes of improving their social and economic position. Free-soil would serve as a guarantee of free competition or "the right to rise." But if slavery was permitted to-expand' the rights of ''free labor'' would be denied. Slaveholders would monopolize the best land' use their slaves to compete unfairly with free white workers 'and block efforts at commercial and industrial development'. The sectional quarrel deepened and became virtually "irreconcilable" in the years between the Democrats' election of Buchanan in 1856 and the Republicans'victory with Lincoln in 1860.